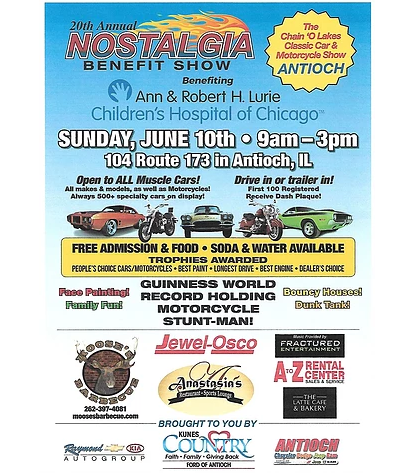 Have you heard the news about the upcoming 20th Annual Nostalgia Benefit Show in Antioch, Illinois? This benefit show will be happening on Sunday, June 10th, 2018 from 9 a.m. to 3 p.m. at our dealership. This event benefits Ann and Robert H. Lurie Children’s Hospital of Chicago. This is a free-admission event with food and beverage available so you can stay nourished and hydrated while you enjoy all of the beautiful collection of muscle cars that will be at the event. Bring the family! There will be bounce houses, a dunk tank, face painting, and the Guinness World Record-holding motorcycle stunt-man. Be sure to bring your kids and family and enjoy a day of family fun with us.